Election Tracker LIVE Updates: Prime Minister Narendra Modi has sought an answer from Congress after a leader of its "ally", National Conference, said that "Kashmir would have a separate PM. Lashing out at the Opposition, PM Modi said, "He (Omar Abdullah) says that we are going back in time and soon things will be like it was before 1953 when India and Kashmir had different PMs. Congress will have to answer how dare its ally say such a thing." Launching a scathing attack on Rahul Gandhi for picking Wayanad as his second seat, Prime Minister Narendra Modi today said that Congress is now scared of contesting from areas dominated by majority population. "The Congress insulted Hindus. People have decided to punish it in the election. Leaders of that party are now scared of contesting from constituencies dominated by majority (Hindu) population. That is why they are forced to take refuge in places where the majority is in a minority," PM Modi said. Congress leader Ghulam Nabi Azad on Monday said though the BJP claims to end terrorism, it was the saffron party's government that released terrorist Masood Azhar and escorted him to Kandahar in Afghanistan. Addressing an election rally of the Congress in Murad Nagar near Ghaziabad, Azad said not a single leader of the BJP has sacrificed their lives for the nation, while the Congress has a long list of such leaders who happily gave their lives for the country. Modi govt reneged on its 2014 poll promises, Congress won't: Ashok Gehlot | Rajasthan chief minister Ashok Gehlot on Monday accused the BJP-led NDA government at the Centre of reneging on its 2014 poll promises and sought to assure people that the Congress would keep all its words, if voted to power. Just like the state government fulfilled all its promises, made to the people of Rajasthan, the Congress would also keep its words, given to the people of the country, if voted to power at the Centre, claimed Gehlot. Gehlot made the promise while addressing several poll campaign rallies here in the state including those in Pratapgarh, Banswara and Udaipur districts. Union minister of state for home affairs Kiren Rijiju has said that even if Centre passes the Citizenship Amendment Bill, it is for the states to decide whether to implement them or not. In case of north east, he said that his party won’t do anything for which the demographic structure of the region gets changed. Congress on Monday announced the Lok Sabha candidate for Karnataka’s Dharwad constituency. 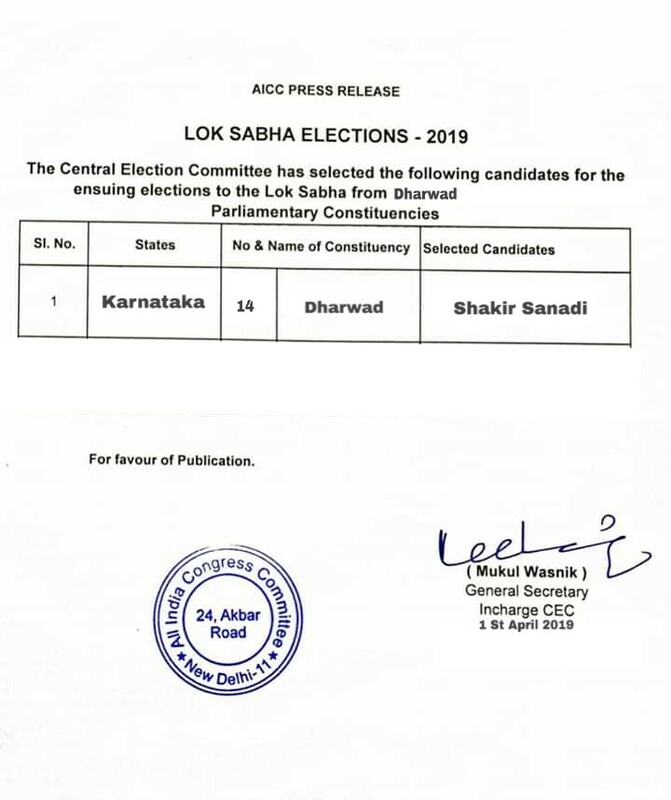 Their press release said Shakir Sanadi will contest again BJP’s Prahlad Joshi from Dharwad. Chief electoral officer of Uttar Pradesh has asked for a factual report from Ghaziabad’s district election office by 12pm tomorrow on UP CM Yogi Adityanath referring to Indian Army as 'Modi ji ki sena'. The Congress has called Wayanad the land of "the lion of Kerela" i.e Kerela Varma Pazhassi Raja, whose fight against the British is a pride for all Kerelites. Hiding this cultural legacy is disrespectful for the people of Wayanad, the press release said. 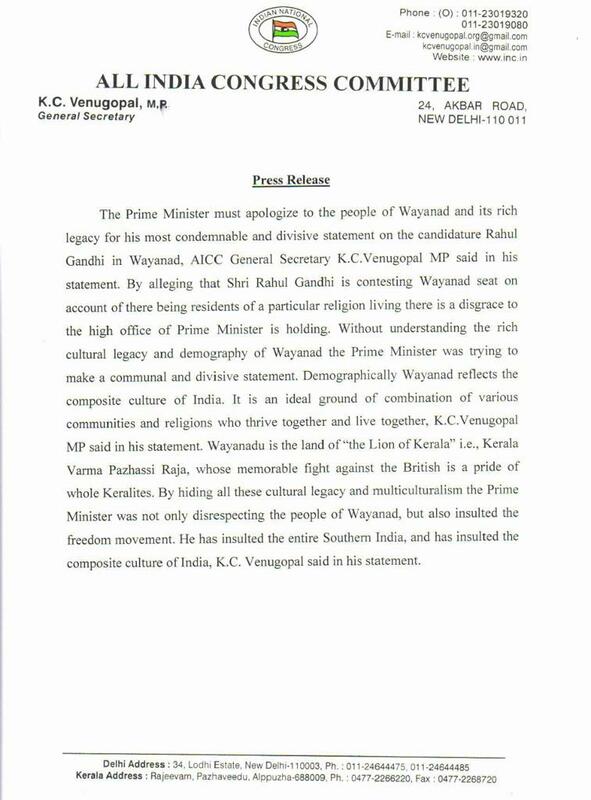 "Without understanding the rich cultural legacy and demography of Wayanad, the Prime Minister was trying to make a communal and divisive statement," the press release further said. Congress Seeks PM's Apology for Wayanad | The All India Congress Committee has sought an apology from PM Modi for the people of Wayanad and its rich legacy. The Prime Minister had accused Congress President Rahul Gandhi of choosing to contest from Wayanad "on account of there being residents of a particular religion living there," a press release by the Congress said, adding that such a move was a "disgrace to the high office of the PM." Dubey is also scheduled to hold another round of meetings tomorrow with the top bureaucrats in Kolkata. Thereafter, on April 3 at around 3.30 PM he is scheduled to reach Bagdogra to hold meetings with state officers from North Bengal to inspect poll arrangements. Jayant Sinha has been re-nominated by the BJP for the Hazaribagh Lok Sabh seat. Sinha is hoping for a second consecutive term from the seat. When asked who will be his main opponent from the Hazaribagh seat, Sinha said the Mahagthbandhan ally Congress is finding it difficult to name a candidate, which is definitely an advantage for him. Union minister of state for civil aviation, Jayant Sinha, said he has the blessings of his father Yashwant Sinha for the upcoming Lok Sabha polls. His three-time MP father had extensively campaigned for him in 2014, resulting in his emphatic win. But, this time he (Jayant Sinha) has to go to the electoral battle alone following Yashwant Sinha quitting the BJP over differences with the party leadership. "The RJD has been a very strong force. Even in the so-called (Narendra) Modi wave during the 2014 election, our candidate got almost four lakh votes and since then, he has never left Begusarai. It was impossible for us to set aside Hasan's candidature. We have a strong cadre that wanted Hasan and there is nothing we could have done. And, this became a deal-breaker," Rajya Sabha MP and RJD spokesperson Manoj Jha told PTI, referring to the CPI candidate's presence calling off any possibilities of an alliance. 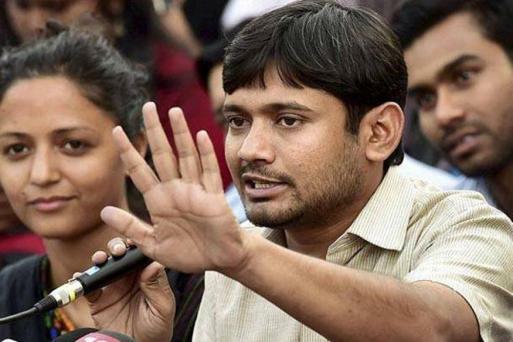 The CPI-RJD alliance in Bihar could not be forged because of former JNU students' union president Kanhaiya Kumar's candidature from Begusarai in Bihar. Considered, the "deal-breaker" Kumar's candidature was doubted by the Lalu Prasad-led party in view of the several controversies surrounding him. Congress' Vaibhav Gehlot Speaks to News18 | Rajasthan chief minister Ashok Gehlot's son Vaibhav Gehlot for the first time after getting the Congress' Jodhpur ticket in the Lok Sabha Elections, arrived in the city. He spoke to News18 on the ocassion "I will try to walk on the path of my father. He made a big contribution to the development of Jodhpur. I will serve Jodhpur like my father." Amit Shah also attacked the Naveen Patnaik government in Odisha and urged people to oust them in a move to ensure a corruption-free administration. He alleged that corruption is rampant under the BJD rule in the state, which needs a "young chief minister" for speedy development. Hitting out at the Congress, the BJP chief said all the accused, including Swami Aseemanand, were recently acquitted in the Samjhauta Express blast case. "Unfortunately, the then Congress government compromised with national security by allowing the real culprits in the case to go scot-free. These (the Congress) people have no concern for national security," Shah said. Amit Shah Attacks Congress on Hindu Terror | In a joint attack along with PM Modi, BJP president Amit Shah Monday at a rally in Paralakhemundi under the Berhampur Lok Sabha constituency also lashed out at the Congress, accusing the grand old party of trying to "defame" Hindus by giving them a terror tag. Prime Minister Narendra Modi also took a thinly veiled potshot at Congress president Rahul Gandhi’s candidature from Wayanad, saying that some leaders have fled to a "minority-dominated" seat to escape "Hindu anger". Sushil Kumar Shinde's comment to ANI comes after PM Modi in his Wardha speech referred to the recent special NIA court acquittal of Samjhauta Express blast accused Swami Assemanand and others, and said the judgment had “debunked the Congress conspiracy” of ‘Hindu terror’. “How can a community known for peace, brotherhood and harmony be linked with terrorism?” Modi said. PM Modi at his campaign rally in Maharashtra's Wardha today accused Congress of coming up with the phrase 'Hindu terror' and said the party and 'insulted' Hindus and their '5000-year-old culture'. 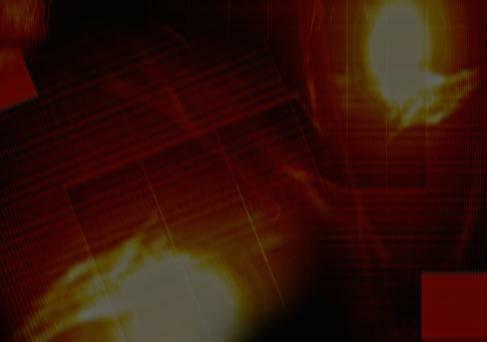 “When you heard the phrase ‘Hindu terror’, did it hurt you deeply or not? In thousands of years of history, is there any instance of Hindus committing a terror act?” Modi asked the audience in his campaign speech. PM Modi's Hindu Terror Comment Backfires | Former Home Minister S Shinde says that BJP is scared ever since Rahul Gandhi and Priyanka Gandhi have started campaigning. "PM didn't speak on jobs, development and farmers' issue. We never raised the issue of Hindu terrorism. It has been long since we did so and that also only on input from intel agencies. He's digging up a 9-year-old issue today, they're scared since Rahul ji and Priyanka ji have started the campaigns," he told news agency ANI. Ahead of polls, public opinion and politics in Sivagangai appear divided. The electorate is voicing real issues like employment, while political parties are indulging in a battle for power. H Raja will contest for the third time from Sivagangai, while this will be former finance minister P Chidambaram's son, Karti's second attempt. Both candidates are confident that victory will be theirs. Amit Shah Rally Tomorrow in Shivagangai | BJP National President Shri Amit Shah will address a public meeting tomorrow, April 2 at 2.30pm in Sivagangai. The Sivagangai Lok Sabha seat is the battle ground for the Congress's Karti Chidambaram and BJP's H Raja. PM Modi accused Congress of coming up with the phrase 'Hindu terror' and said the party and 'insulted' Hindus and their '5000-year-old culture'. Earlier, Modi slammed Chandrababu Naidu's Telugu Desam Party (TDP) for "stealing" data of residents. Addressing a rally in Rajahmundry, he said, "I have been told that TDP has started a new work, and that work is related to cyber crime. The 'Seva Mitra' app they talk about, is neither doing 'Seva (service)' nor it is a friend. The truth is that app is stealing people's data." It has been alleged that the company that developed the Seva Mitra app for the TDP, stole data of Andhra Pradesh beneficiaries from the state government database and processed the data without consent. The BJP today announced Thushar Vellappally as its candidate from Kerala’s Wayanad, pitting him against Congress chief Rahul Gandhi. Vellappally is the son of Vellappaly Natesan, who heads the SNDP, a powerful social organisation that represents Kerala’s largest OBC community, Ezhavas. BJP chief Amit Shah, while announcing the candidature, called Vellappally a vibrant and dynamic youth leader and with him, “NDA will emerge as Kerala’s political alternative”. BJP chief Amit Shah today hit out at Naveen Patnaik during an election rally, saying the Odisha Chief Minister had not learnt Odia even after 19 years in power. 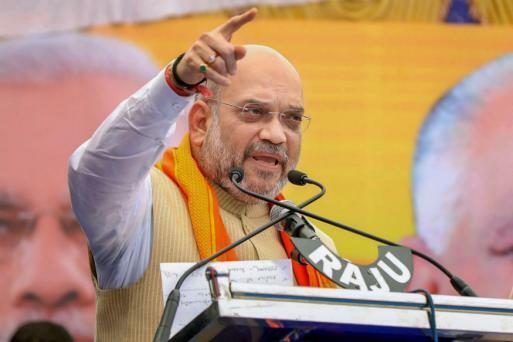 Saying the Patnaik government had to be uprooted, Shah said throughout the country states and languages may change but the clamour for Prime Minister Narendra Modi to return was constant. Gandhi will now take the campaign forward to Wanaparthy, which is under the Nagarkurnool Lok Sabha constituency governed by the Congress. Following this, he will reach Huzurnagar that falls in Nalgonda Lok Sabha constituency represented by the TRS. Meanwhile, Prime Minister Narendra Modi launched a direct attack on Sharad Pawar during his election rally in Wardha, saying even the NCP chief knew which way the wind was blowing this time. Modi said the Congress-NCP alliance was like “kumbhakaran” in Maharashtra and Pawar, despite being a farmer himself, forgot the concerns of the community. “One of Pawar’s problems is that there is a big family war going on in the NCP. The party is getting out of their hands and the position is that Pawar's nephew is slowly occupying the party. This is why NCP is also facing a ticket-sharing battle,” he said. Telangana chief minister and TRS supremo K Chandrashekar Rao is set to address a rally at Ramagundam this evening.